The British Government has condemned vote-buying, which was rampant in the recent Ekiti State governorship election. 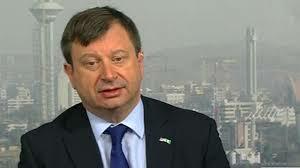 The British High Commissioner to Nigeria, Paul Arkwright, described vote-buying as a form of electoral misconduct like rigging and ballot stuffing, while addressing journalists shortly after a meeting with the Chairman of the Independent National Electoral Commission, Prof. Mahmood Yakubu, in Abuja on Friday. He said, “I was there in Ekiti to monitor elections and I heard a lot of reports of alleged vote buying and we are convinced that some vote buying went on. I condemn it. Vote buying is illegal; it is against the law, it is just as vote rigging, it is just as bad as ballot stuffing. “We cannot make a distinction when all these activities are illegal so I condemn that. What are we going to do about it? Well we just had a meeting with the chairman of INEC, we have been talking about public awareness and how the political parties themselves can take responsibility for condemning this action and not continuing it. The British envoy, however, commended INEC for the conduct of elections in recent times, saying the UK government had faith in INEC and its leadership. Arkwright also said the UK and United States governments had pledged $60m (N21.6bn) to voter education in Nigeria for the next six years. He added, “I think the election process itself went well, the materials were there, the security forces kept their distance and did manage to keep a peaceful election and we are seeing progress in how INEC is carrying out each election. So, we have confidence in INEC and the chairman. In his remarks, the Department for International Development Secretary of State, Penny Maudaunt, advised security agencies to be neutral in conduct even as the 2019 general elections approach. Maudaunt said, “Though the elections were largely peaceful and results widely endorsed by stakeholders, vote buying by both the main political parties was widely criticised. “There is time to tackle some of the challenges noted before next year’s elections. But INEC will not be able to solve all electoral problems on its own. Everyone in society has a role to play and a contribution to make.